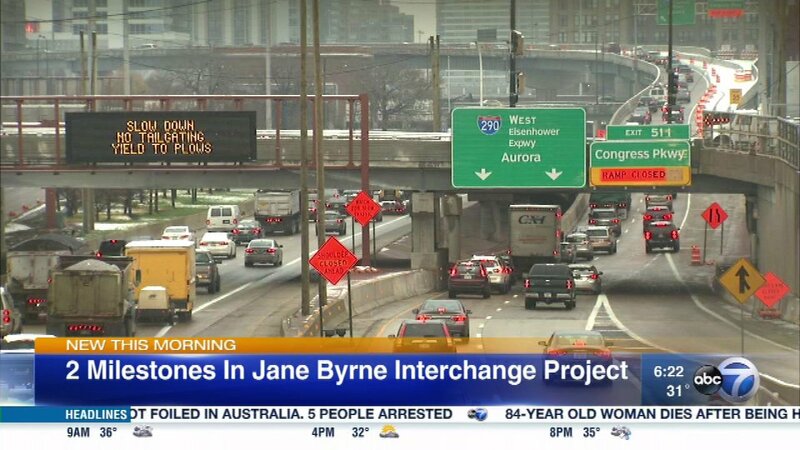 CHICAGO (WLS) -- The Jane Byrne Interchange reconstruction project reached two milestones on Friday. The new Taylor Street Bridge over the Dan Ryan Expressway was finished. The bridge was widened to two lanes in each direction. It now includes bike lanes and wider sidewalks on each side. The $18 million project began in April 2015 and also includes new signals and lighting. The flyover ramp linking the inbound Dan Ryan to the outbound Eisenhower Expressway is also completed. The previous connection between the two expressways was a single lane ramp with no shoulders. The new ramp is approximately one-mile long and has two lanes, though only one lane is currently open. The second lane will open when the next phase of work on the outbound Eisenhower is completed in 2018.